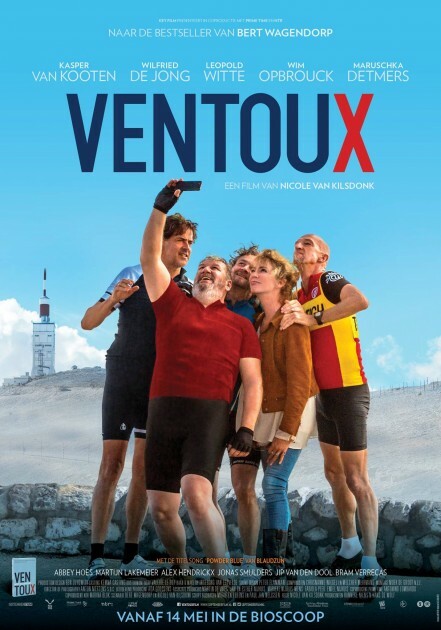 A group of friends reunite after 30 years to climb the Mont Ventoux again as they did in their youth. 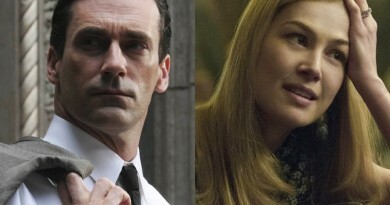 One person is not present at the reunion, a ghost from their past. On the way to the top mostly looking for answers to questions from past and present ,they do what men do so well: alternating between heavy seriousness and trivial lightness. As much of the film’s action is played out riding bikes, we needed to find a way to film this, without disturbing the actors with the noise of an engine or its exhaust fumes. Also we needed to be able to record dialogue while they were riding uphill at a slow pace. Stylistically we didn’t want the images to look like they were part of a live sports broadcast. They needed to be taken from different angles and demonstrate the hardship, excitement and speed of climbing and descending this mountain. After looking into several electrical camera vehicles, mostly based on golf carts, we concluded that none of them would have sufficient power or a lasting battery to ride up and down the mountain several times a day. Most of them would only have lasted 30 minutes. 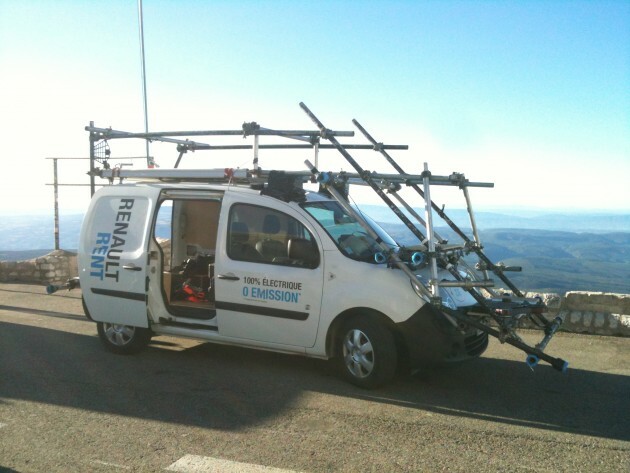 To overcome this I came up the idea to use commercially available electric vans, of which the Renault kangoo seemed to be the best choice. An advantage was that it was available for rent in the 2 countries where we needed it: Holland and France. Key grips Phillipe Desmet and Marc Freyens designed and build a rig that allowed me to film from the front and the back of the car, sitting comfortably in a seat, being able to pan more than a 180 degrees around the car. 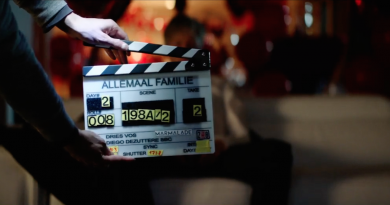 While the rest of the crew: sound, director, AD and AC were sitting inside. 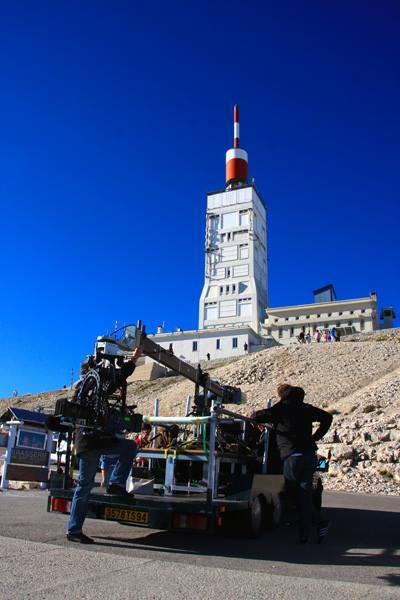 On top of the car a platform was made for the boom operator to sit and work from. As this was all electric it made for the most smooth tracking vehicle I have ever used, being able start and stop as one would to with a dolly and accelerating without feeling gear changes. This will definitely be the future for process shots. 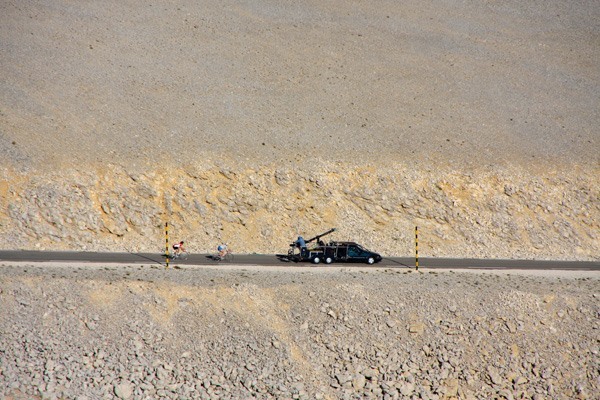 Going downhill required a different tactic, as we wanted to be low and close to the bikes to accentuate their speed. To do this a russian arm would have been the tool to use, but was unavailable to us. 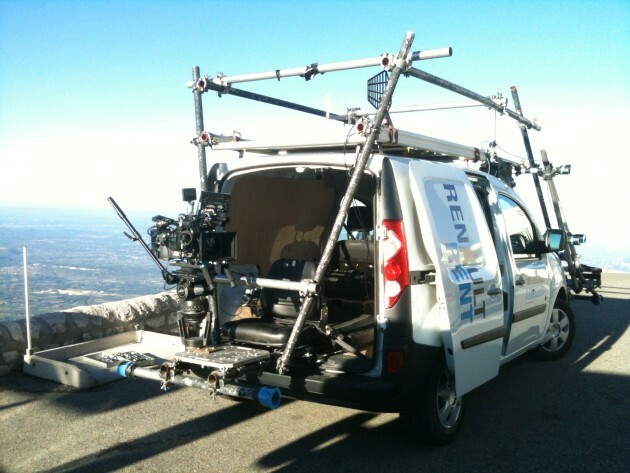 So we had to resort to a stabilised remote head mounted on an aerocrane arm, rigged on the platform of tracking vehicle. We did some tests with the movi, but on longer lenses and at higher speeds this did not prove to be stable enough for our needs. We settled on the english made Mosys remote head using a zoom on the alexa for quick shot variations.